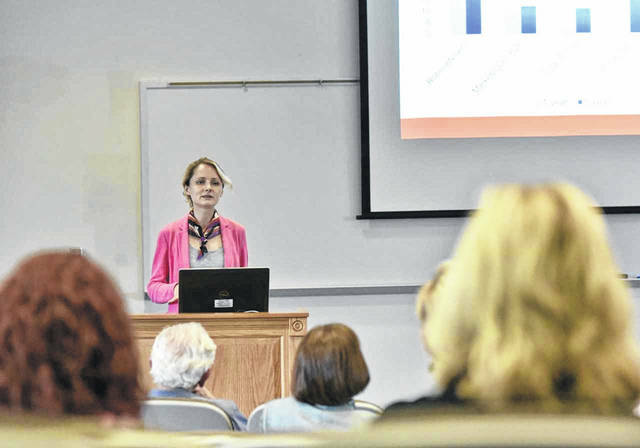 RIO GRANDE — The University of Rio Grande and Rio Grande Community College recently hosted Fulbright Scholar Dr. Anastasiya Luzgina, deputy director at Belarusian Economic Research and Outreach Center (BEROC), to present her lecture, “FinTech Development and Cryptocurrency Market Regulation,” to campus. Luzgina, who is from the Republic of Belarus, gave a speech that included an in-depth look at FinTech, a new financial system format that is adaptive to information technologies and innovations, and how it works to create easier digital operations for investment banks and their clients. She also provided details about how the program has been used to improve the economy of Belarus. Luzgina is one of the heads for the National Bank’s FinTech Market Development research project and said she first became interested in the program because of past research in related fields.